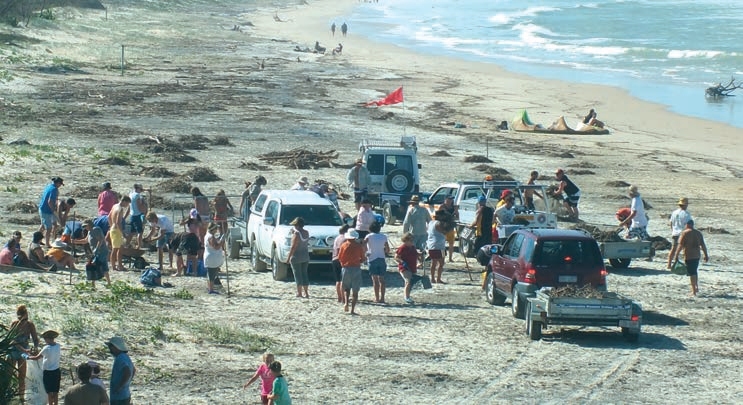 l ages and nationalities even volunteer surf lifesavers, were down on the beach for operation “Clean up after Oswald”. 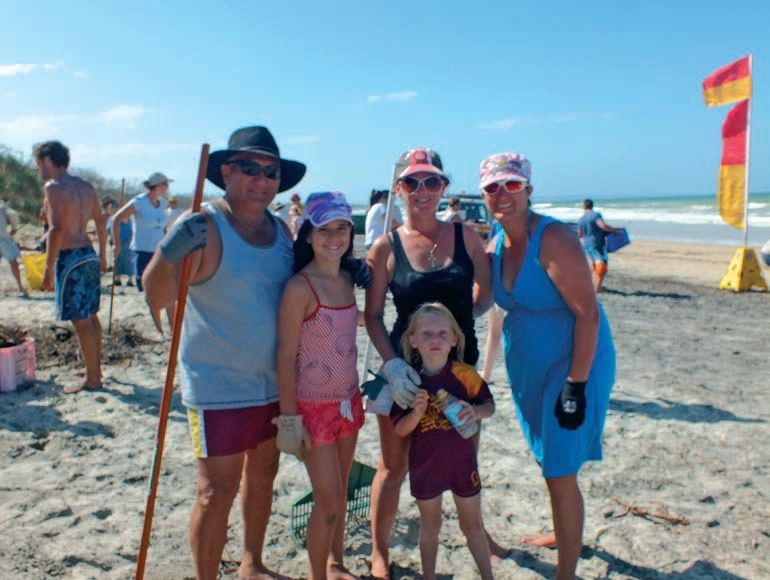 It was estimated around 150 people converged on the beach – some in boots and others in bikinis – to clear the sand of piles of sticks and rubbish. Promoted by the Modin family, they spread the word with posters and through facebook to encourage as many on the beach that Sunday afternoon, February 3. 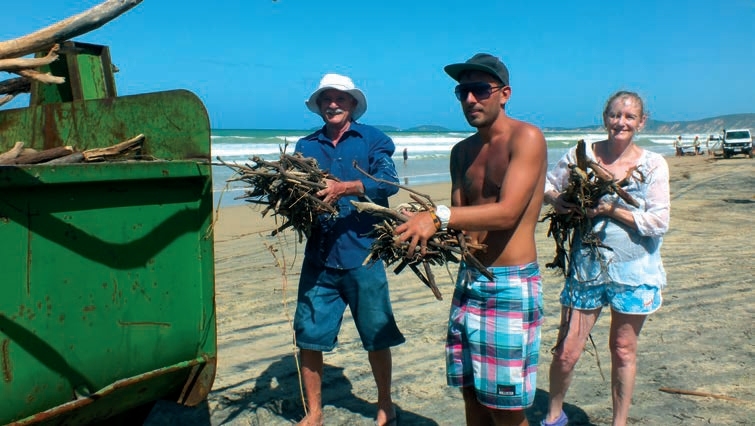 Rainbow Beach fared better than many other communities affected by ex-tropical cyclone Oswald, however our beach was riddled with sticks and debris from the storms. Ruth Modin spoke to The Mayor and Council CEO and they were shocked to see the mess on the shore. With council workers so busy inland with the damage, Ruth knew the quickest way to clean up “our lifeline” was a working bee. 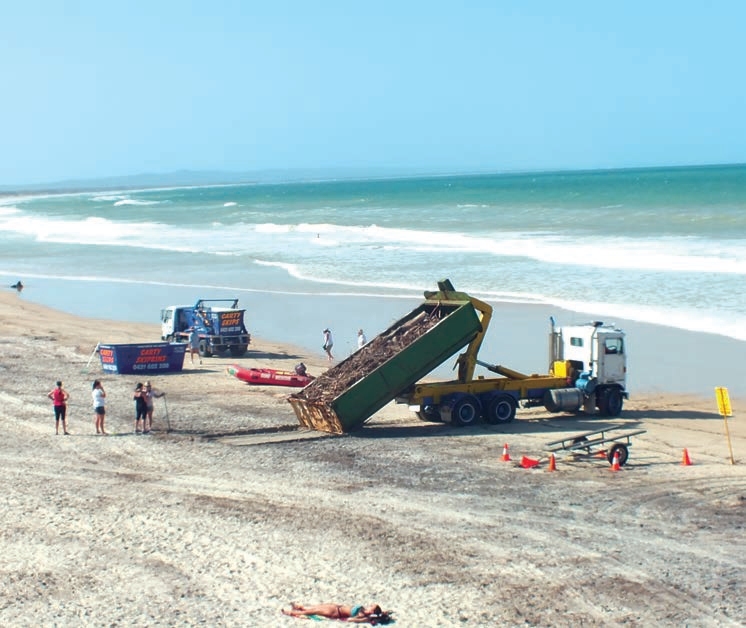 It was a huge job – from the Mudlo Rocks in the South to past the last beach entry to the North, at least 400 metres of coastline were cleared. It started at 2pm and did not fi nish until 4.30pm. A couple of skydivers provided some entertainment when volunteers had to stop to give them room, then the sand army resumed operations. A bikinied backpacker from the UK said they were laying on their towel, soaking up Rainbow’s rays when they realised there was a clean-up happening all around them. So they joined the group and picked up sticks with lots of locals. They said it was impressive to be part of such a community effort. 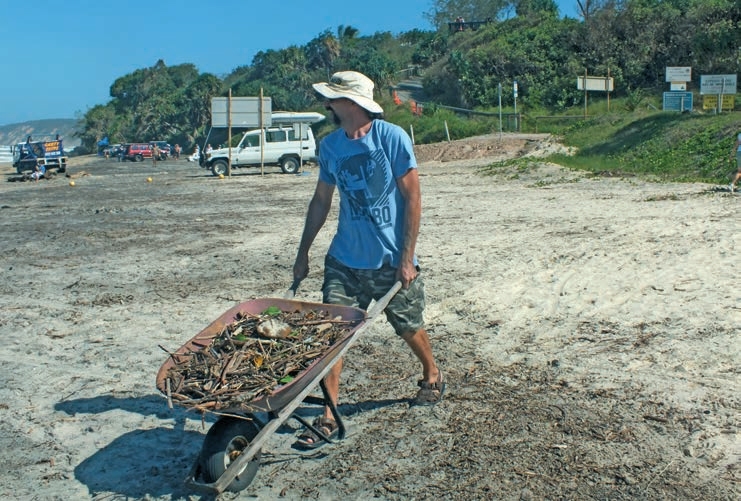 Starting at the rocks, groups collected the debris and placed it in the nearby skips, utes and trailers whilst north of the skips, more formations of volunteers raked the strewn rubbish into piles. It worked like a well-oiled machine; raking, lifting, dumping and all the manoeuvring of vehicles in between the people and other runners to the dump. 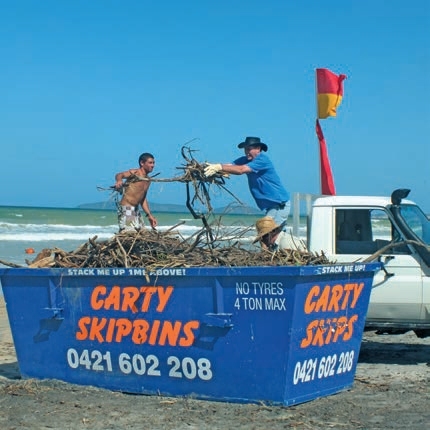 Darren Cross from Carty Skip Bins told us that there was easily 200 cubic metres more at the dump after the massive beach clean-up. Armloads, handfuls, crates, sacks and buckets of sticks were emptied into huge 16 cubed metre skip bins. Darren told us the Dodgey’s low loader took 4 trips to the dump, that people fi lled 11 of his smaller 6 metre cubed size skip bins and over 10 trailers or utes made many trips back and forth. The Council made sure there were no charges for the dump and everyone volunteered their time and equipment. Thanks go to Darren, Sharkey and Dean and Wayne Hayes and all the other vehicles for the countless trips to the dump. 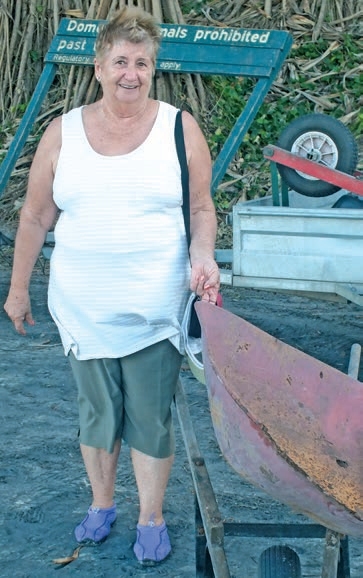 Local Rita Mancktelow says “I brought 2 wheelbarrows and 2 rakes to the beach, and then I never saw them anywhere the whole time.” She told us they were in constant use and returned to her at the end of the clean-up. One wheelbarrow was on its last legs (or wheels) and fi nished its long life after the workout. Rita says it is destined to be retired as a big fl ower pot in her yard. A BBQ and beer get together was organised for the post clean up and thanks must go to local businesses owners Sue, Darryl and Scott Fitzgerald from Rainbow Beach Meats, Matt and Bernie from the Rainbow Beach IGA, Foodworks, and BBQ cooks Joe and Cheryl Zunic. Drought relief – items needed right now!